Yahoo Japan Corporation (“Company”) aims to contribute to the development of information technology society. To this end, we promote open innovations through R&D in Yahoo! JAPAN Research, patent applications according to our intellectual property strategy, OSS (Open Source Software) development and others. With its vision of “UPDATE JAPAN”, the Company is solving the issues facing the country through the practical use of some of the world’s largest collection of multi big data. Yahoo! JAPAN Research, which is supporting this effort with leading-edge technologies, is working on the research and development of the next-generation of Internet technologies. In addition, in order to create an environment that constantly produces innovations, we actively encourage creations through “Invention Incentives” and “Award Programs” to recognize excellent ideas and designs, etc. At the same time, in order to ensure fair and free competition, our basic policy is to focus in the construction and use of intellectual property portfolio mainly around our own patents, and to respect other companies’ intellectual property rights. The outcome of our R&D as well as our intellectual properties are open to external users in the form of OSS, etc. with which we hope to contribute to the development of an IT society. Given that various devices are used in different everyday life situations, and the collection of a variety of data continues, Yahoo! 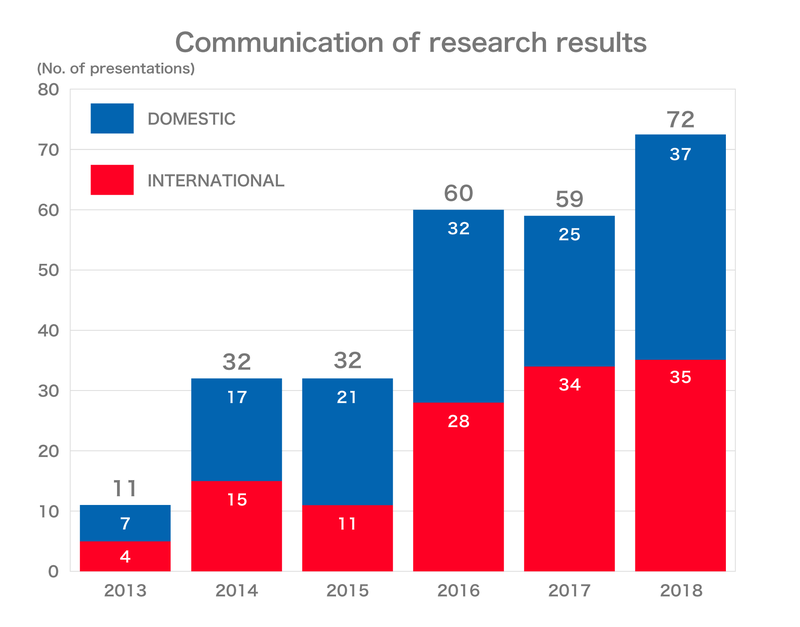 JAPAN Research’s goal is value creation leading to next problem-solvings by further deepening our understanding of individuals and trends in the world. Yahoo! JAPAN Research is broadly collaborating with the Company’s service divisions, and several universities and research institutes, in order to achieve maximum results from the valuable environment that is the enormous amount of data collected daily at Yahoo! JAPAN and feedback from the customers using its services every day. Yahoo! JAPAN Research also runs an internship program for undergraduate students in anticipation of broadening their research and development career and opportunities. Yahoo! JAPAN Research also has a policy of actively publishing the results of its research and development activities. We disseminate not only the results of joint research performed with universities, but we also recently started providing information about the results of our collaboration with development on the Company’s services side. A research to “predict” an irregular population density based on the location histories from a few days ago resulted in the “Irregular Congestion Prediction” function that predicts an irregular congestion at stations or trains by 10 minutes. In October 2018, we adopted “FIDO 2” for which we engaged in the design of technical specifications and reviewed the implementation method. This enabled users of android smartphones to log into the Company’s services in web browsers by using biometric authentication such as fingerprint authentication. 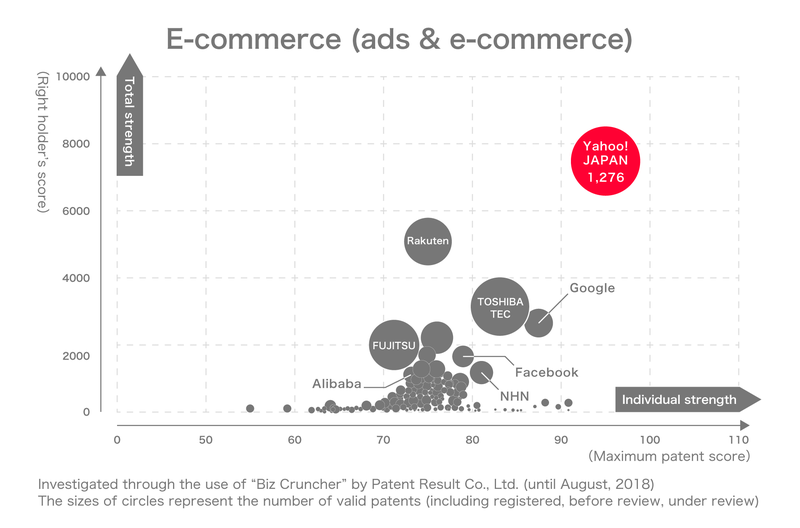 Using the Patent Score (※), the diagram demonstrates the total strength of each company’s patent asset on the vertical axis evaluated from the quality and quantity of patent assets possessed, and the individual strength of the most valuable patent of each company on the horizontal axis. The sizes of circles represent the number of patents each company has. 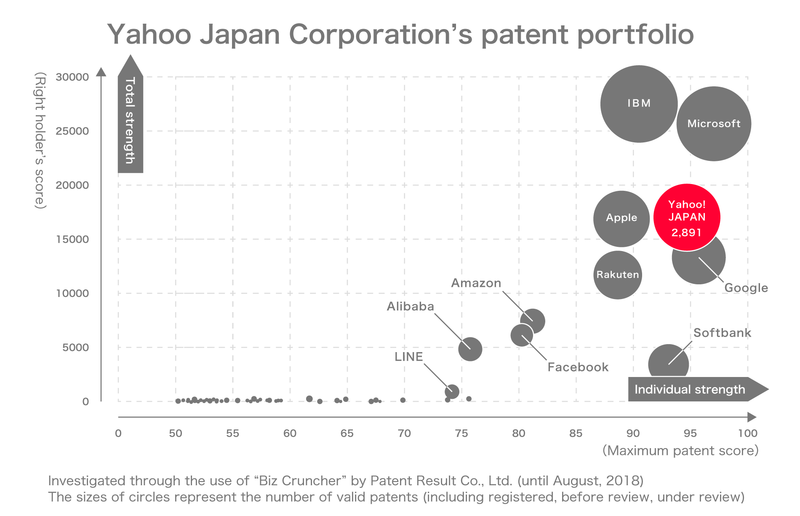 Yahoo Japan Corporation favorably compares with other world-leading companies in terms of domestic patents on the whole. The Company particularly has a strong position in the field of e-commerce, which is one of its focus areas. 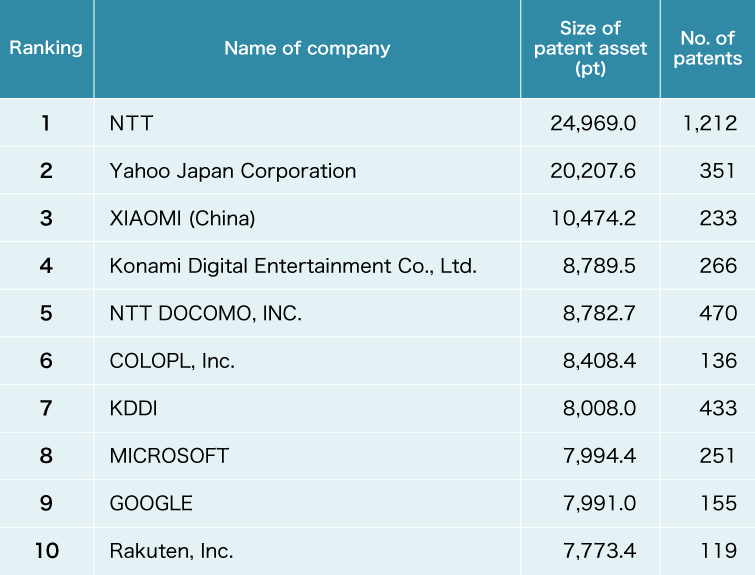 Source: Patent Result Co., Ltd.
Patent asset ranking is a ranking that comprehensively evaluates each company’s patents in terms of both quality and quantity, using the Patent Score. 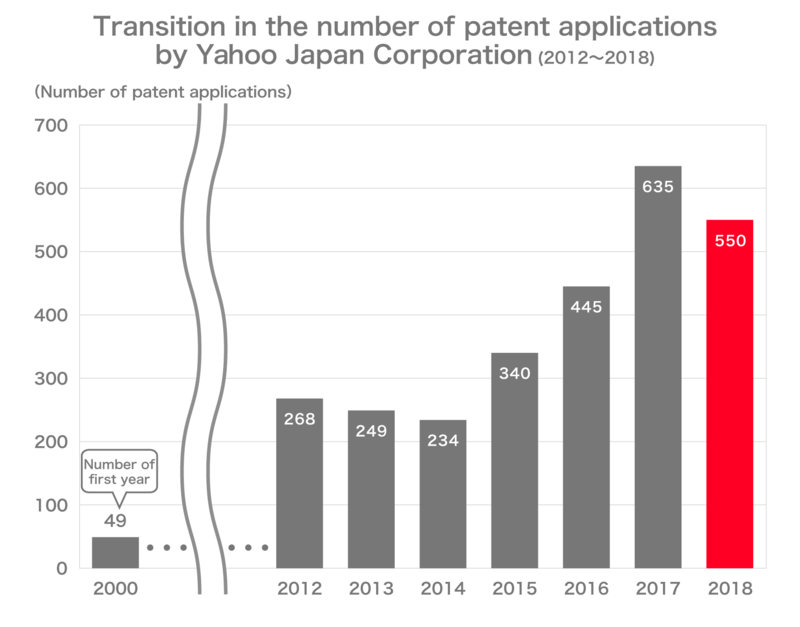 Yahoo Japan Corporation placed second in the category of patents’ total strength in “Patent Asset Ranking for the Information-communication Industry 2017” published by Patent Result Co., Ltd. Among the high-profile patents of Yahoo Japan Corporation are “Information-processing device that provides users with a transit search service which flexibly meets users’ needs” and “Technology that prevents low resolution of images in multi-perspective video technology”. The Company started the current Invention Incentives and Award Program in 2014. Ever since, the number of patent applications is increasing every year (over 600 applications in fiscal 2017). In recent years, Yahoo Japan Corporation promotes the utilization of its multi big data, the Company’s strength. The Company makes an all-out effort to conduct R&D in the field of data science, which supports utilization of data, as well as to improve services utilizing data. The Company actively makes patent applications in order to protect these research results with patent rights and to capitalize them. In order to contribute to the development of the information technology society, Yahoo! JAPAN Research’s development results and part of the intellectual properties created in Yahoo Japan Corporation are made available to the public in the form of OSS, etc. Many of them are being utilized in various situations. We believe that encouraging to create a healthy market will also lead to the future development of Yahoo Japan Corporation. This is a program that certifies selected employees as developers for OSS which is strategically adopted by Yahoo Japan Corporation. Time used for developing specific OSS is regarded as work hours and a maximum of JPY 1 million budget per year is granted for the certified employees to work as OSS committers. NGT is an OSS developed by Yahoo Japan Corporation. This is a software that allows users to quickly search and identify data with multiple characteristics such as text, image, product/user data (high-dimensional data) from a large database. NGT is also used in e-commerce platform “BASE” operated by BASE, Inc.
AnnexML is an OSS developed by Yahoo Japan Corporation. This is an AI technology that effectively learns combinations of big data such as “information on a user’s service usage”, with hundred thousands of options such as “ads clicked by the user”. At the fastest speed and highest accuracy in the world, this AI technology predicts the most likely combinations such as “which ad will be clicked the most by a user on whom we have information on service use”.